Braxton Labs announced a big change not only in package design but also in it’s beer release schedule! In 2018 Braxton Labs channeled innovation from tanks to taps, and this year we wanted to see that innovation spread further than just the Taproom at Labs. In 2018 you saw a monthly bottle release, kept secret until the Monday before each Friday release (we just love surprises!). This year we’re rolling out the whole schedule so you can take a peek at what’s to come. As is the nature of the brewing beast, this schedule is subject to change based upon ingredient availability, tank space and numerous other factors that can affect any brewing schedule. We’ve reimagined the Labs package brand to streamline releases, and put an emphasis on product differentiation. In 2019 you’ll see some familiar fermentations coming from Braxton Labs as well as some newcomers that we’re ultra-excited for. We’ve broken down the beer schedule and designated 4 styled series’ – New England IPA, Dessert Berliner Weisse, Pastry Stout, Milkshake IPA and 1 series called The Graduates. 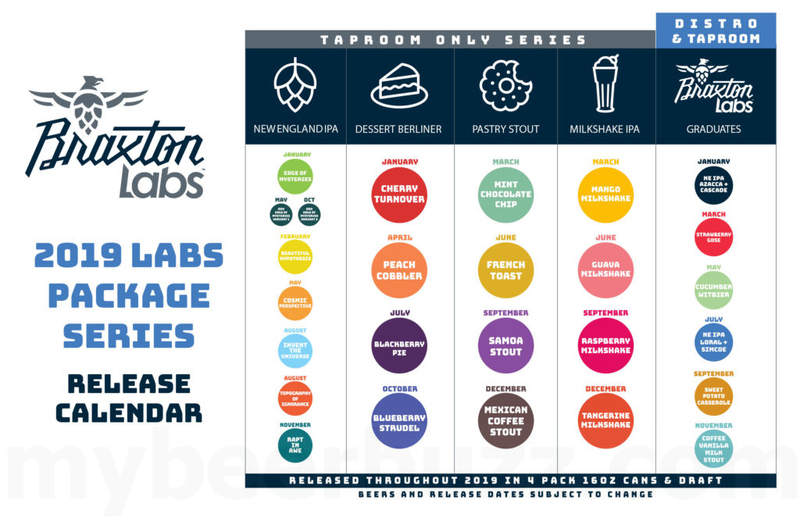 The 4 styled series’ will be released in the Braxton Labs Taproom on Draft, and in 4-pack 16oz cans. While The Graduate Series will be distributed in Kentucky. To keep everything straight, we made a handy downloadable release calendar below. 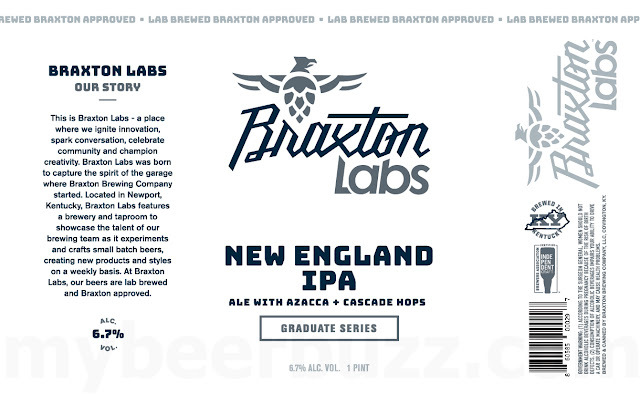 Since the inception of Braxton Labs, New England IPAs have been a huge part of our brewing repertoire. We opened Labs with a New England IPA on our first ever menu, and have been exploring the bounds of the recipe ever since. New England IPAs (otherwise known as NE IPAs offer a less-bitter version of the full bodied West Coast Style IPAs that you may be more familiar with. Taking all of the sweet, aromatic, citrus and floral flavors from the oils in the hops and leaving behind the bitterness. Edge of Mysteries New England IPA is available now in the Taproom at Braxton Labs. Berliner Weisse is a notably sour beer, lower in ABV% and brewed primarily from malted barley and wheat. We’ve been experimenting for a while with adding fruit, baking spices, and lactose to our Berliners to create different beers reminiscent of your favorite desserts. Cherry Tart Berliner Weisse is available now in the Taproom at Braxton Labs. Pastry Stouts are similar to Dessert Berliner Weisses in that the “pastry” aspect comes from the malt styles which are typically chocolate and caramel malts and adjuncts (spices, fruits, etc) that are added to the beer during production. One rendition of our pastry stouts you may remember from 2018 is the Samoa Imperial Stout. Which was made with coconut, cocoa nibs, and vanilla beans. A crowd favorite, the Milkshake IPA is a sub-style of the New England IPA. Typically brewed with extra fruit-puree additions and plenty of unfermentable sugars and adjuncts such as vanilla, the result is a full-bodied texture and thick opacity reminiscent of your favorite frozen treat. Recall the Pink Guava and Apricot Milkshake IPA from Braxton Labs in 2018 – brewed with purees from both fruits and conditioned on vanilla beans for added sweetness. The Graduates are not defined by a certain style, rather they are beers that have made former debuts at Braxton Labs and quickly became crowd favorites and “graduated” to be brewed and canned again. The first in the Graduate Series was our Azacca + Cascade New England IPA – which first made an appearance in 2018. Others you’ll see brewed again this year are Strawberry Gose, Cucumber Wit, and Sweet Potato Casserole. The Graduate Series – unlike the others – will see small scale distribution to craft beer retailers throughout Northern Kentucky, which means you’ll be able to find it both in the Labs Taproom, and at your favorite bottle shop. Solidifying a new packaging format for Braxton Labs has been a process of experimentation. We’ve been on a journey of exploration with the Braxton Labs brand since we first opened. However we find this rather fitting to the mission and mantra at Labs. Igniting Innovation, Sparking Conversation, and Championing Creativity. Our goal is for these beers to do just that. Keep an eye on our social media pages to find out when the next releases drop, and study the handy release calendar below to learn more about this year’s lineup. We hope to see you around Braxton Labs soon, and as always – Lift One to Life!